I'm Curious Too: How Fast Can Thor Fly? Early February, astrophysicist Neil deGrasse Tyson tweeted that Thor's hammer weighs as much as a herd of 300 billion elephants. That's one heavy hammer. In fact it would sink all the way to the core of the Earth if Thor accidentally dropped it. 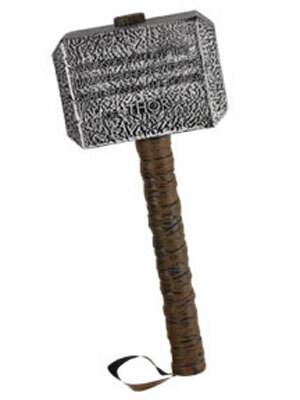 Last week Matt Shipman reported that the weight of Thor's hammer is in fact not that heavy. 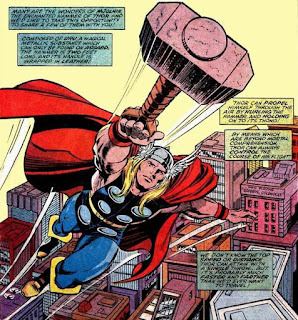 Marvel issued a “Thor’s Hammer” trading card in 1991 which states that the hammer--named Mjolnir-- is made of Uru (fictional metal from the realm of Asgard) and weighs precisely 42.3 pounds. From the movie The Avengers we see Thor flies by first spinning and then hurling his hammer towards a target, and hanging onto the hammer strap. But the Marvel Wiki puts Thor's weight at an incredible 291 kg. So can a 19.19 kg hammer take a 291 kg demigod to the sky? If no, how fast should Thor spin the hammer in order to accomplish flight? That translates to roughly 10 km/h. Pretty slow if you ask me. Not the sort of speed you would expect from a flying god. 3) Go on a diet. In fact if Thor weighs as much as I do, i.e. 54kg, his flying speed would improve to 11.79 ms-1 i.e. 42.47 km/h. It's time to go on diet, Thor.